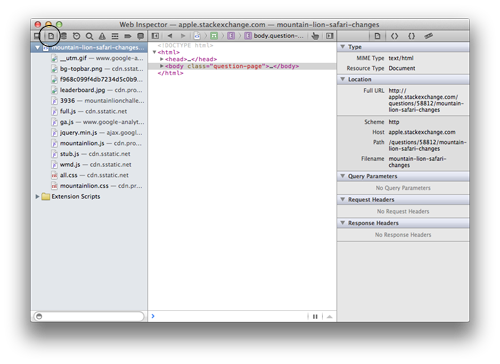 I upgraded to Mountain Lion, there are a lot of differences in Safari 6. Have the four features below been relocated? If not relocated, are there fixes? Activity window (previously: Window -> Activity) is gone. Bonjour access from the bookmarks menu is gone. 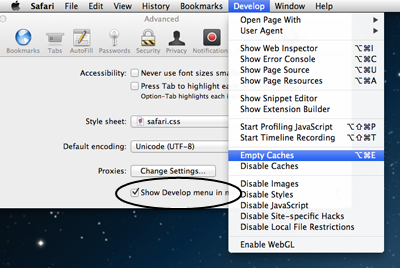 Ability to empty cache (previously: Safari -> Empty Cache) is gone. delete/backspace key no longer works for going to the previous page. To download YouTube videos, reload the page after opening the web inspector and double-click the videoplayback resource. To download it, you have to focus the location bar and press ⌥↩. ⌘S only saves some metadata. Actually, Bonjour is still there, but you have to include it yourself. Just go to Preferences > Bookmarks, and enable what you'd like there. The delete/backspace key navigation has been removed. The popover works as expected – click and hold the toolbar item to reveal a menu. The manager, which appears in a separate tab, fails to list reopened windows that were minimised before quit. I reported this bug to the developer, with reference to this post. Well I found out that in Mountain Lion, Bonjour is available from Safari > Bookmarks > Bonjour > Device. I still haven't figured out the other problems. Not the answer you're looking for? Browse other questions tagged safari web-browser bonjour . How to mimic Safari 5 Activity window with Mountain Lion, to save FLV video files? How to make the Backspace key to take me to the previous page in Safari 6? What are the three different bookmark features in Safari used for? How do I download embedded media such as Flash video in Safari 6? Safari: How to show a loading indicator in tabs that are loading? How to prevent Safari Technology Preview opening default Safari on launch? What happened to Bonjour in Safari 11 and how do I access it?